Between WDW vacations and visiting out-of-state family, it feels like we travel alot. A few years back, I found a method of cooking that helps put a good meal on the table when you're short on time. This is really handy when you're just back from vacation and having a hard time dealing with the real world again. I am referring to "freeze ahead" or "large batch" cooking. No matter what you call it, it's great. I love it when my freezer is full of items I can use to quickly and easily feed my family. 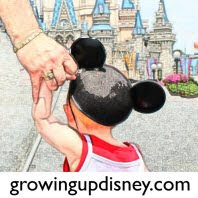 While this is a little off topic for a Disney blog, we're all busy all the time, so why not make life a little easier between trips? 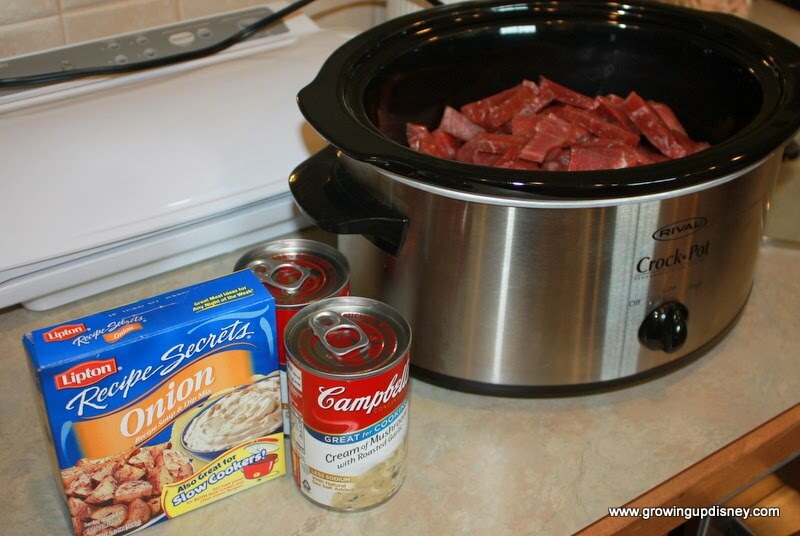 Let's start with a very simple recipe for round steak. One of the great things about cooking and freezing large batches is that it allows you to take advantage of good prices on food items. The next time round steak is on sale at your local market, buy a couple of packs and try this recipe. I am fortunate that my inlaws raise cattle and give us beef, but I never quite know what to do with the round steak. Now we enjoy this ridiculously easy meal. Slice the round steak into strips. I like to cut mine while it's still slightly frozen so it slices more easily. Place into your crock pot. Top with remaining ingredients and stir well. Cook on low for 5-6 hours. Stir a little sour cream into the portion of the mixture that you'll be eating immediately. Leave the sour cream out of the portion that will be frozen. I serve it over rice, but potatoes or egg noodles would be good too. Freeze the leftovers in quart-sized freezer zipper bags, pressing out as much air as possible. The amount you'll put in each bag will depend on how many people you need to feed. These were set up for two adults. Be sure to label and date the bags. 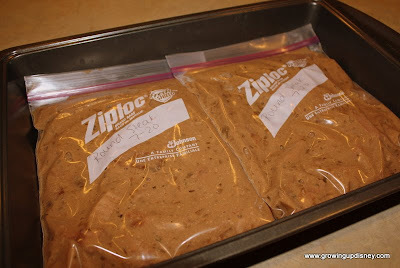 Lay the bags flat in a cake pan and freeze until solid. The frozen bags stack really nicely in your freezer. This trick works great for all sorts of recipes: soups, sauces, taco meat, etc. When you are ready to serve, open the bag a little to vent and microwave it for about a minute. Once it's thawed enough to break apart with your hands, transfer the mixture into a saucepan and heat thoroughly. Before serving, stir in a little sour cream. 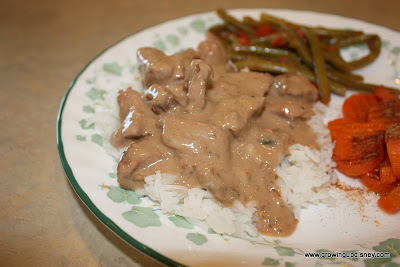 In the picture, I've served this with what I call Italian green beans and Granny's carrots. Both are also freezer-friendly. I'll cover them in a future post if this one goes over well. Freeze ahead cooking requires a little planning but it pays great dividends. It's wonderful to know you can have a homecooked dinner on the table in the time it takes to cook rice. And since you've done all the real prep and cooking on another day, the clean-up is minimal as well. Just what you need as you're readjusting to the real world. Please check out our other recipes and home ideas. This sounds very similar to our family pot roast recipe. 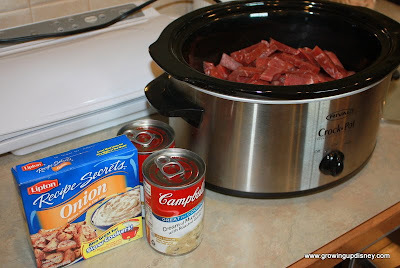 We do a bottom round, 2 cans of mushroom gravy, 2 cans of cream of mushroom soup, 1 package of dried onion soup mix. Put in oven for 3-4 hours at 350. Remove and slice meat. Put gravy out as well. We serve with veggies, applesauce and egg noodles. Yum! So simple! I love the idea of posting different things that help with time management and other things like that between trips! Great idea. And the recipe sounds delicious. Thank you all for sharing your great ideas! I'll post more in the future.